San Diego has world-class mainstay restaurants, like Mister A’s, George’s, and Addison. But new blood is good for the restaurant scene’s circulatory system. Here are eight restaurants that have made a significant impact since opening in recent months. The biggest project from one of San Diego’s hottest restaurant groups and one of the biggest the city’s seen in years, Born & Raised takes an American classic – the mood-lit steakhouse – and flips it on its head. In lieu of oil paintings, we get framed portraits of gangster rap icons, plus some of the country’s best craft cocktails. They’re dry-aging everything in-house for optimal meat quality, and reviving an American dinner classic: tableside service (Caesar salads, steak Dianne, French omelets, you name it). Chef Brian Malarkey is best known for his TV feats (Top Chef, Guy’s Grocery Games), but locally him and partner Chris Puffer have made names for creating what is arguably the most stunning dining experience in town at Herb & Wood. Malarkey and partner and co-chef Shane McIntyre’s cumin-carrots are a thing to behold, and the housemade pastas are phenomenal – try the oxtail gnocchi. Café Chloe’s tiny French bistro was one of the trailblazers in Downtown’s East Village. While the food is phenomenal, the pure design libido of the place makes every diner feel 300 percent more attractive. And Minou, a creperie and private party space opened by Café Chloe’s owners a couple of blocks away, is even prettier. Plus, the crepes (savory and sweet) and Euro-style coffees are top-notch. Carlsbad has always been a quaint, lovely seaside town in San Diego. But no one claimed it a modern, groundbreaking place to eat or drink – until Campfire. A chef, bartender, and GM spun off one of the artsiest restaurant groups in town to build this winner. It’s an ode to fire and smoke – it even has a teepee out back. Try the brisket plate with furikake (Japanese spice mix), or any of the mind-bending craft cocktails from the bar. The Pendry San Diego is one of those projects that sends local mouths agape. It’s hip, well-designed, and impressive. Lionfish is its 150-seat main dining attraction, overseen by one of the city’s rising star chefs, JoJo Ruiz. Though it’s a seafood-centric menu (we got an ocean here! ), the lamb tartare with vadouvan yogurt is a show-stealer, as is the big-eye tuna pizza. Buona Forchetta made its name for pizza in the artsy little burgh of South Park. Owner Matteo Cattaneo’s family owns one of the best olive oil companies in Italy, and they ship him over the best of each batch. For this new spinoff at Liberty Station, Cattaneo partnered with Chef Mario Cassineri, a pasta-whisperer who owned BiCE in Downtown for nine years. The result is an all-around Italian winner. Tiny sleeper hit this year. Once a cheese shop, the owner brought on a new partner and a chef who used to work for one of the city’s top caterers (Miho), and went tapas. The ahi tostadas are tiny but delicious, with a blue-corn crisp, avocado crema, morita ash, radish, green onion, and chive. The lamb chops with cilantro-aioli are also a must-try. But tapas is a drinking cuisine, so don’t ignore the well-selected wines at the bar. 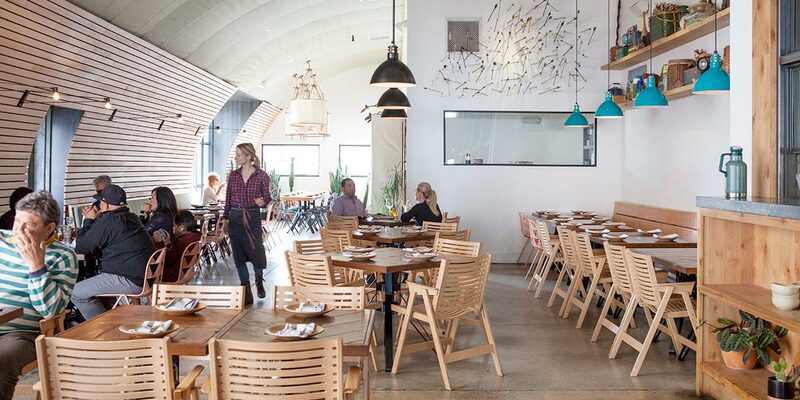 Last year’s runaway best new restaurant was Trust, where chef Brad Wise was blowing people away with his wood-smoked dishes (that braised oxtail raviolini will alter you). They doubled down, literally down the street, with this bar-food spinoff. Try the hen egg pizza with burrata and Calabrian chiles, the steam beer-fried fish tacos, or add some whiskey or booze of choice to one of those naughty shakes (Almond Joy, Mexican Hot Chocolate, Lemon Meringue).